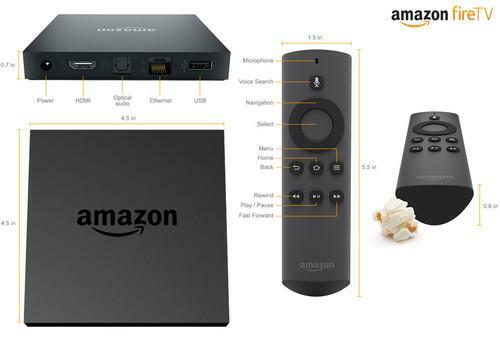 Amazon might not be first out of the gate with a streaming media box, but its new Fire TV device hints at bigger plans for reaching consumers in their living rooms. Priced at US$99 -- the same as Apple TV and the Roku 3 -- Amazon's slender box lets users choose from over 200,000 movies and TV shows for rent or purchase from Amazon Instant Video, and also streaming video from sources like Netflix, Hulu Plus and Crackle. The box has a quad-core CPU and a dedicated graphics chip, which Amazon claims will allow it to download and play 1080p video faster than its rivals. It also includes a voice search function and lets users shift their movie watching between their TV and an Amazon Kindle Fire tablet. Amazon hasn't made money selling hardware in the past and the Fire TV is unlikely to be any different. It will be an important vehicle through which the company can sell movies, video games and other content. And commerce is unlikely to be far behind. "The company will eventually want to help you buy things in the living room," Forrester analyst James McQuivey said via email. The voice feature might allow users to simply state the name of a product while they're watching an ad on TV, for instance, and Amazon will quickly find it in its online store. "Only Amazon can piece that entire experience together in the living room, and though we don't see evidence of that ambition here today, we should assume Amazon knows this and is planning on it," he said. Fire TV would be an "upgrade" for Apple TV or Google Chromecast users looking for a better TV experience, according to McQuivey. Amazon has commissioned TV shows for distribution through Fire TV. While they might not prove as popular as Netflix's "House of Cards," that could help set Amazon apart, said Crawford Del Prete, chief research officer at IDC. Netflix has its own shows but no hardware device, and Apple its own hardware but no unique shows. Amazon will have both. "The long game is to tune into Amazon like it's a channel," Del Prete said. "The vision for Amazon is to create their own content and streamer." If Amazon can produce good shows, people will be more likely to gravitate to its streaming device, and Amazon has the scale and the resources to distribute more original content, Del Prete said. The box also gives Amazon a better way to experiment with new business models and distribution methods, said Del Prete. In contrast, cable providers have been focusing on improving content to retain customers. Roger Kay, principal analyst at Endpoint Technologies Associates, agreed that more original content could set Amazon apart from competitors, and noted it already has strong relationships with movie distributors. "It's an evolution of Amazon's desire to be a widely accepted content provider," Kay said. Amazon will still need access to the data pipes operated by the likes of Comcast, Time Warner and Verizon, and those companies bundle their own video content with their Internet services, making them rivals to Amazon, Kay noted. Amazon may have to cut deals with those Internet providers to assure a good quality of service. Amazon is a bit late to the streaming device market, but more important is whether it can offer a compelling package of services, said Bob O'Donnell, principal analyst at Technalysis Research. The TV market is being turned on its head, with people accessing content through set-top boxes, tablets and streaming boxes. With Fire TV and its Kindle Fire tablets, Amazon is turning into a strong multi-device content provider, O'Donnell said. Its challenge will be to understand the type of content people want to watch, and how they want to watch it. "Is Amazon a big enough player to drive movement in that area? That will be interesting to see," O'Donnell said.